How Much do Teardrop Campers Weigh? A Teardrop Camper may be the solution you have in mind to keep life adventurous, fun and simple while still having some added comfort in the great outdoors. 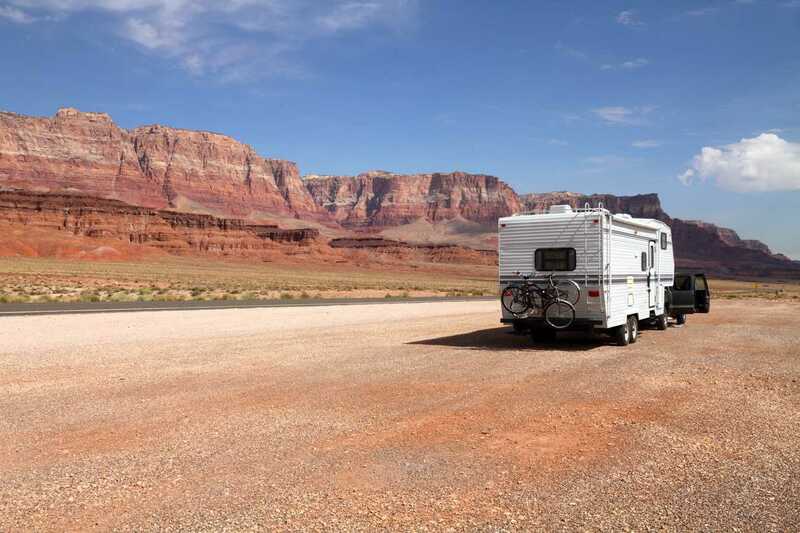 While there are not as many manufacturers specializing in teardrop style campers as other standard recreational vehicles, you’ll still find a wide variety with amenities to suit your needs. These campers range anywhere from 518 pounds to 3,140 pounds. Teardrop campers are not new to the industry. They gained popularity as far back as the 1930’s but made a comeback in the 1990’s. They are compact, lightweight, aerodynamic and super easy to tow. These features give the teardrop its appeal and makes them more popular than ever. Setup is a breeze making it effortless to camp most anywhere, including times you want to boondock. Many outdoor enthusiasts prefer the back-to-nature feel the teardrop offers. 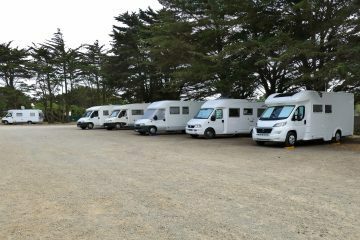 Depending on whether you choose a new or used teardrop, the prices can vary from $4,500 on up to $20,000. Prices will be comparable to many other larger travel trailers or pop-ups. Let’s take a look at some teardrop campers and what they have to offer. Once you see just how cool these little guys are, you’ll be intrigued to get your own search started. The ATD Osprey measures 3.5’ X 7’ with a dry weight of 518 lbs. This twin bed sleeper can be pulled by any car, including electric. It has a tube steel welded frame and rust preventative coating. With one single door, a window, carpeted walls, a large fantastic vent and LED exterior lighting, you’ll be able to slumber peacefully at night. The Osprey also makes a similar model with a queen bed that weighs 620 lbs. The ATD Osprey is straightforward and perfect for those wanting a more primitive camping experience. 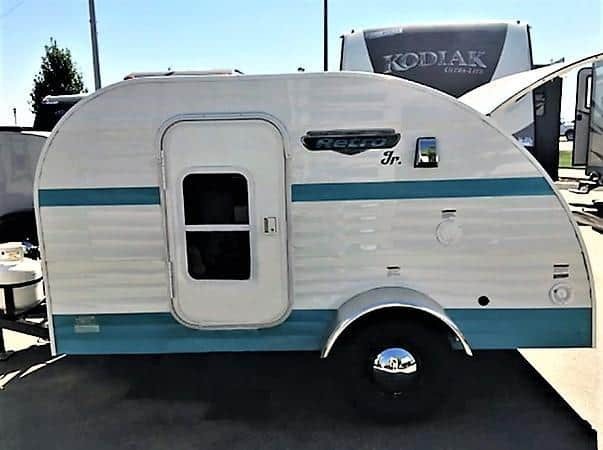 Manufactured by NuCamp, they advertise their teardrops as the “highest quality available.” There are two available floor plans, the T@g, at 1,046 lbs. dry, and the T@g XL with a dry weight of 1,210 lbs. Both are “cute” as can be to the female eye, but the male camper will appreciate their ruggedness and functionality. There’s even a T@g Boondock model to take that off-road experience to the limit! Both models share an interior length of 9’6”. The T@g XL has an interior width of 6’, while the T@g’s interior is 4’. 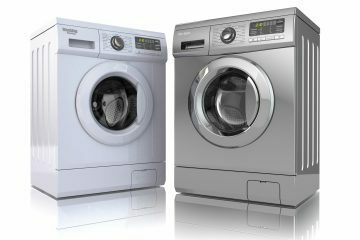 Both offer an 11-gallon fresh water tank, a Danby wall air conditioner, 3-speed fantastic fan and a 19” TV and stereo system with Bluetooth capability. 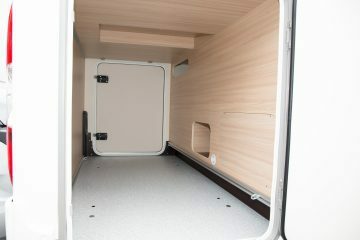 The interior sleeping space in each T@g offers storage under the bed. You’ll find an awesome exterior outdoor kitchen at the rear in both models. The kitchen features a stainless sink, 2-burner stove, microwave and a 12-volt cooler with electronic temperature control panel that displays the internal temperature. This cooler also gives you the ability to set the temperature as you like. There’s even plenty of counter space for food prep or happy hour setups. Little Guy is a big name in the teardrop industry. What started in a garage in Canton, OH in 2002, has grown to a production of thousands on the road across the globe. There are several models to choose from. 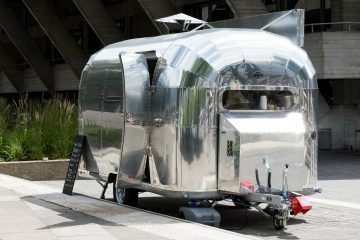 Weighing in at 3,140 lbs., their largest teardrop model, the Little Guy Max, has an impressive interior height of 6’7”. This Little Guy loads of great stuff packed into its overall length of 21’. The interior floor plan provides adequate storage, a generous wet bath, queen bed, dinette, entertainment center and kitchen that includes a 4.0 cu. ft. refrigerator, 2-burner stove, single sink, microwave and hot water heater. The exterior is equipped with a TV mount, outdoor speakers, LED lighting, pass through storage and a 2” rear receiver for a bike or storage rack. Constructed with a lightweight aluminum steel cage, seamless fiberglass roof and finished with an automotive powder coat finish, the Little Guy has this Max covered. There are additional options that can be added, several color choices, as well as a vintage-style to customize your Little Guy. You’re sure to feel a freedom with plenty of comforts in this teardrop home. Rustic Trail is a fairly new manufacturer out of Mt. Airy, NC — yes Mayberry USA. They produced their first teardrop, the Papa Bear, in 2010 and have since added 3 more models and built 238 teardrop campers and counting. They have an intriguing website and from researching reviews, the craftmanship is excellent quality. Rustic Trail builds for the minimalist in mind. All models come with an elevated queen size platform bed that transitions into a 2-person dinette, storage under the bed, solid birch cabinets, LED lighting, high velocity roof vent and a long counter at the front of trailer with storage underneath. Since this is a small manufacturer, it is easy to customize one of their models to fit your needs. There are many options available including a 5,000 BTU AC, rear outdoor camp kitchen, front rack, battery package, roof rack, a canopy style awning and an outdoor table, to name a few. Dry weight on their models range from 950 lbs. to 1,450 lbs. There’s even a model with an interior height of 6’. They’re all about functionality and simplicity. 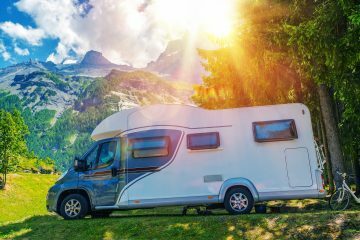 United Recreational Vehicles, LLC manufactures the iCamp and produces a revolutionary teardrop with a stylish design and one-of-a-kind technique in manufacturing. A high gloss fiberglass skin is laminated over structural Styrofoam made by Dow Chemical Company. Don’t let the word “Styrofoam” scare you away. It’s tough, and this teardrop is designed with a powder coated steel frame and reinforced aluminum tubing frames. The furniture is curved for style and best use of space. A large U-shaped sofa sits at one end with a free-standing dinette table. At the opposite end of the camper, you’ll enjoy a queen-sized bed. The unique kitchen is downright functional and uses space wisely. It’s not forgotten cabinet and counter space as well. iCamp provides adequate holding tanks for fresh, gray and black water, and the Elite comes standard with a one-piece modular ample bathroom. With an interior height of 5’ll” and dry weight of 2,366 lbs., the iCamp is not only sensible but economical to tow. The lively, cool color options for this teardrop make it that more much fun! Located in Nashville, TN, PeeWee has been in the industry for over 40 years. 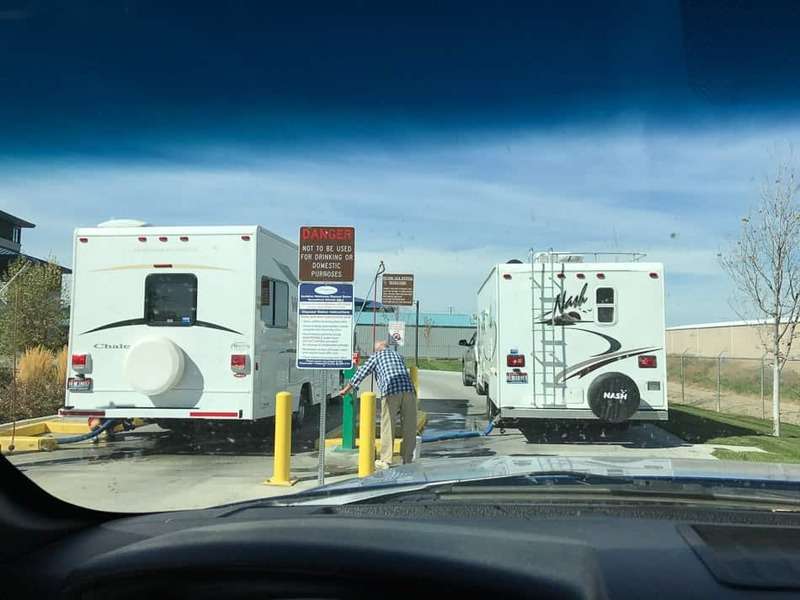 In 2016, they expanded their line of RVs to include tiny, small and medium sized teardrops to fit your budget. PeeWee is factory direct, no middle-man, in order to offer you the best price possible. Their newest model, Big Brother, has a heavy-duty 5’ X 10’ interior frame and an impressive interior height of 6’3”. The dry weight of 1,010 lbs. makes this teardrop ultra-easy to tow for camping expeditions, fishing trips, races or outdoor events you may be planning. The top section of the bed rotates upward against the wall during the day which allows the lower bed to serve as a sofa. The sofa cushion lifts up to reveal underneath storage. The kitchen sink has a 5-gallon water tank capacity. It also houses a table with storage cabinets above and a nifty fold down smaller table at one end giving you additional eating or counter space when needed. The 3.2 cu. ft. refrigerator even has a separate door for the freezer. Big Brother comes equipped with a porta potty with the capacity for 4 gallons of fresh water. The toilet can be flushed 33 times before it needs emptying. A 5,000 BTU AC is standard for this model and comes with a quiet sleep model. Electrical 30-amp service is also standard. PeeWee Campers pride themselves on quality and customer satisfaction. With new teardrop campers ranging from $4,800 to $13,995, one is sure to fit the bill. 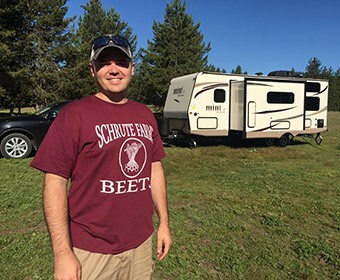 Why might a teardrop camper be right for you? When thinking smart, comfy, efficient, thrifty and carefree, there’s a hundred reasons. The teardrop lifestyle is a growing community of friendly, laid-back folks that know how to have a good time. There are gatherings, shows, forums, clubs and more to get involved with and learn more about teardrop camping. Teardrop campers are sturdy, secure and provide you more time in the great outdoors – it’s the reason you loved camping in the first place! Teardrops have evolved with options, designs, floor plans and construction methods. A teardrop truly could last you a lifetime. These campers will pretty much go anywhere your vehicle goes. This allows for effortless boondocking adventures, quick and simple weekend trips close to home, or the advantage of sustainably expanding your horizons to travel long distances while keeping your ecological footprint as small as possible. Discover the teardrop way of life, and you’ll find less really is more. Give the teardrop camper a chance to win your heart and be on your way, footloose and fancy-free, to camping on your own terms. Nancy Ferri is recently retired. She and her husband are avid campers who plan to hit the road next year to enjoy some longer adventures throughout the U.S. They also enjoy kayaking, hiking and bicycling in the great outdoors.